Well today was a very bittersweet day. We decided to make the 95 mile run to the deep of the Lindenkohl Canyon to fish the piece of water out in the back there. We made our way out and smooth sailing all the way. We pulled the throttles back once we got there and started to look around for marks on the sounder or some kind of life before lines in. I went to put the throttles back up and we instantly smelled antifreeze. Uh oh. Been here before. We did a few checks and came to the conclusion the issue is most likely major. We made the decision to start pushing back towards home on one and fish a bit on our way. It didn’t take long before we were covered up with 10-15 pound mahi and caught 4/5. Dropped lines back in and a White Marlin came in on my bridge rod with a DownSea Blue Party hat and ballyhoo. Game on! In the turn we had another white come up on our teaser but it did not eat. Casey got a clean release on that one. And we got back on it. We were marking plenty of bait and had a little time so we decided to make some passes. Not long after the white we had a sizable blue come in on my bridge rod, this time a black and red Party Skirt on a medium ballyhoo. She piled on and off she went! We immediately got lines in and started going after her. This fish was all over the place and did three rounds of amazing series of jumps and greyhounds showing her size to be around 600 lbs. Casey got the release and off she went. What an awesome show from the bite to the fight! We got lines back out and WHAM! White Marlin on my right teaser (blue squidnation squid chain with a black/purple Ilander Express with a mullet). Spencer got the bait and switch on his naked ballyhoo and fish on. Jody was on this one and we got a quick release. Lines back in and a few more passes and then and explosion behind the same teaser. About a 150# blue all over it. Justin was able to switch this blue to the big pitch and game on. He got Casey on the rod immediately and after a great fight she got another clean release on her second blue and third fish of the day. AWESOME!!!! 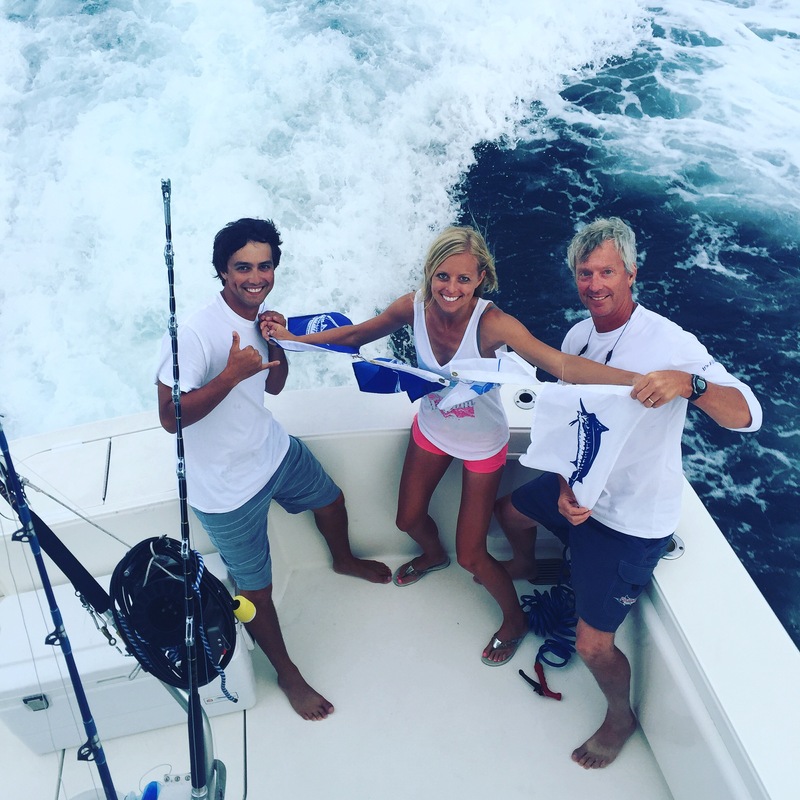 We made a couple more passes and then the right long naked ballyhoo goes off, white Marlin hooked up. Unfortunately we pulled the hook on this one early in the fight and then had another white come up shortly after that did not eat. Awesome few hours of action that we unfortunately had to leave to get in by 9pm to hand in our tournament slip since we knew we would be 10 knotting home on one engine… Hoping to figure out how to get out on another boat tomorrow to use and hopefully end strong for the tournament. We made our way back down to the southern inshore lumps again searching for tuna. The bite has been very hot or miss but when it’s on, it’s awesome! Anyway, we setup on anchor in flat calm seas around 530am and started chunking. We stuck it out here until 1030 and only had a mahi and a Bonita to show for it. We picked up and mosied around a bit looking for marks, and a friend gave word of a little pick of yellowfins on bother lump so with nothing going on where we were we made the move. By about 1130 we setup on the drift and got the butterfish chunks going. The water was so clean today you could see them go for a ways so if anything came in our slick we would know it. We ended up getting hooked into. Fish on the bottom rod right away and got the nice 50 pound yellowfin in the boat. We waited some more and at 12:10 we started seeing some books on the surface then yellowfins cutting the surface. What an awesome sight. We saw this for 5 minutes before our first bite, but then, it was game on! I had an overnight trip with an awesome crew from last year aboard the 48′ Ocean Yacht ‘Justified’. Expectations were high since these guys have whacked some bigeyes with us the past two years. 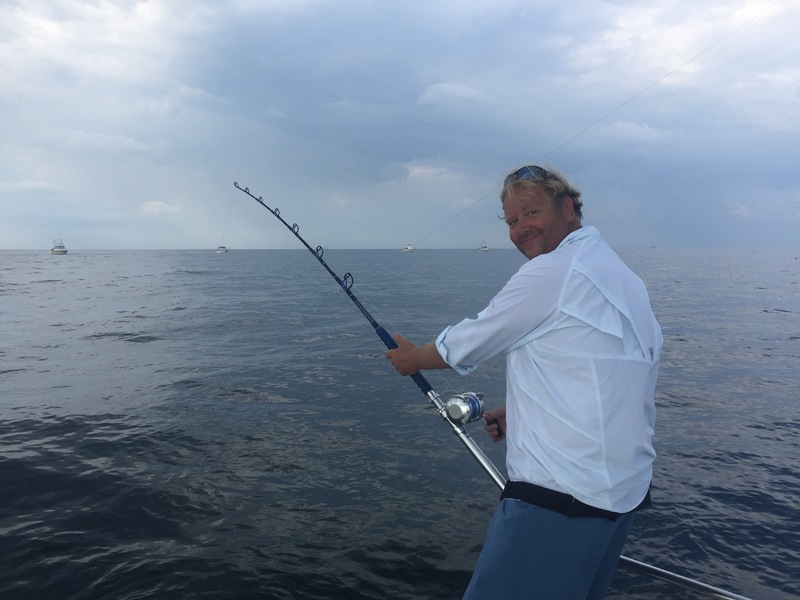 With the bite being relatively slow, we gave it a shot in the deep of the Baltimore to see if the white marlin were still being there from eh epic bite boats had earlier in the week, but unfortunately that was pretty much over and nobody had done well there Thursday. 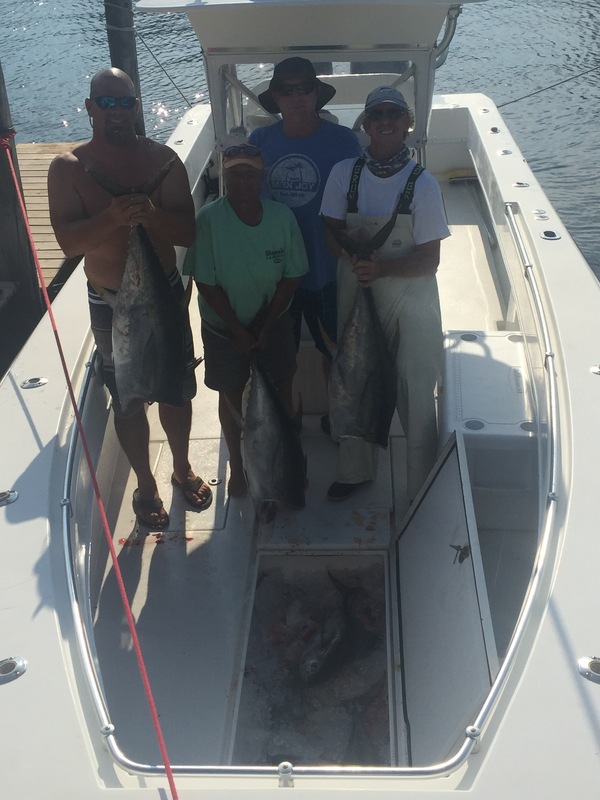 We picked up and ran into the Baltimore and switched over to bigeye fishing and as luck would have it a white marlin piled on the right short rigger. After an awesome aerial show we pulled the white over the rail for a very quick photo and released the white swimming strong. The bigeye bite never materialized for anyone and we gave it until about 11pm. With the wind picking up a little early we ran inside to Massey’s (might as well be my second home this month) since this was our best shot at getting some tuna. Not much happening at night except a few squid in the lights. As we started to get light we got our first bite on a free floating butterfish and game on. We played the under and over the anchor game and then the kite bait came tight on a small throwback yellowfin. Fighting these tunas on light 30# flouro leader is tough, but the boys did well, were patient, and finessed the fish to the boat for the gaff shot. It was slow for another hour or two before we came tight on the same bait and again, were on the bow for the majority of the fight. As we were fishing this one we hooked into another that broke off right away unfortunately. We stuck the gaff in the second keeper yellowfin after an hour fight and that was all she wrote. Although the fishing was slow, overall we still had a fun trip. Positive vibes among everyone goes a long way on fishing trips! I fished today on the What’s Next, a 35′ Glacier Bay with Bruce Griffin. We slipped out the Cape May Inlet and took our time trying to let the storm cell stay well ahead of us. It certainly put on an awesome light show! We made our way to Massey’s and anchored up by 5:45am. 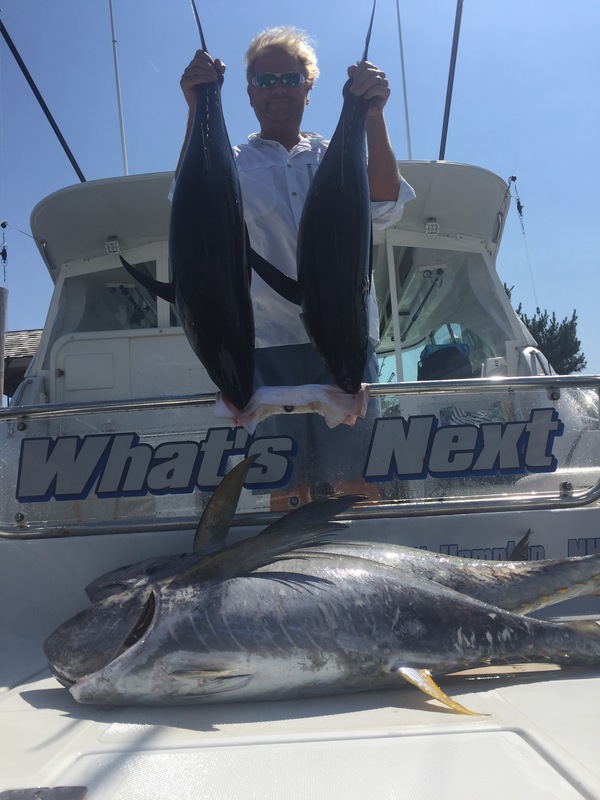 We started tossing chunks and it didn’t take long before the free floating butterfish got picked up by a nice 50# bluefin tuna. Bruce put in a solid fight and brought the fish to the gaff. Great start. The morning was slow and we didn’t really see many hookups. About 2 hours after our first fish the half a butterfish half way down the water column out on the balloon goes off. 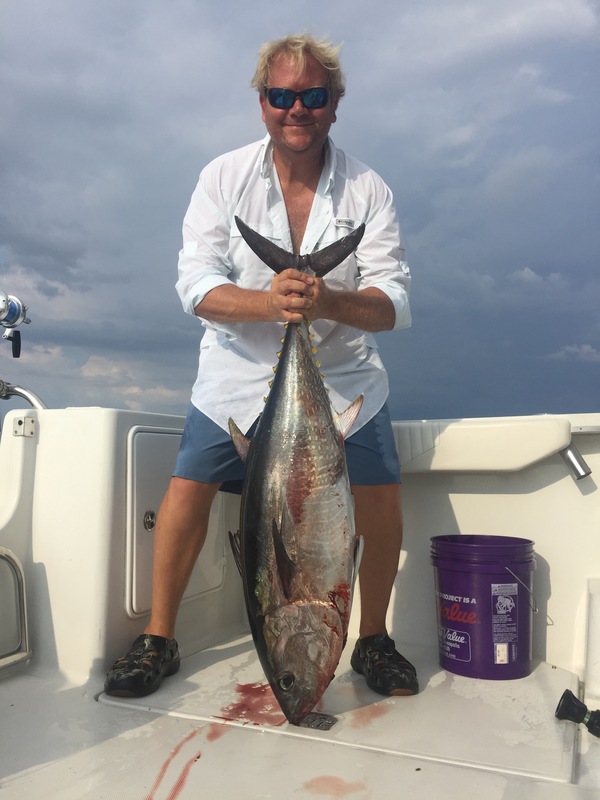 this one was a nice sized 40# yellowfin. About an hour later the same bait and rod goes off, and unfortunately we broke this one off. 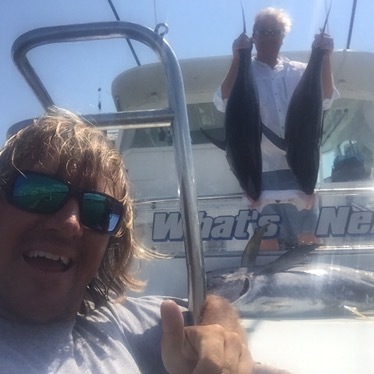 Around 10:00am it was game on with yellowfins right behind the boat in our chunks. What an awesome site to see. We were getting double header no problem on the spinning rods with 30# fluorocarbon leader. We popped a few off, but there were only two of us so keeping the bite going was chaos, and so fun. We put 4 yellowfins in the boat and called it a day leaving them biting. Very fun morning and great times! Well right now with the lack of water in our closer canyons, it’s been tough offshore fishing. Regardless, we tried out the 500 Square and the Wilmington Canyon today. The water along the natural 100 was blended blue and 77.5 degrees. Not much to it though. We found a weedline in the NE Corner of the Wilmongton and had a round of mahi bites there but that was all. Worked over the lobster pot balls on the west wall and picked up a few mahi there. Pushed into the east notch but nothing really special, and the water was green. A few boats managed a white Marlin but overall very slow fishing. With the tournament time ending at 3pm, we packed it up and headed home. Tough one..